"This is a recipe I made up after eating LOADS of bland chicken breasts. 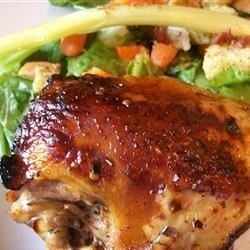 Chicken is so easy to prepare and this recipe makes the meat extra tender and juicy." Bake in the preheated oven until the chicken breasts are golden brown and no longer pink in the center, 30 to 40 minutes. An instant-read thermometer inserted into the center should reach 165 degrees F (74 degrees C). A wonderfully garlicky gourmet dish with chicken, vinegar, and mushrooms. I marinated for about 1.5 hrs and then grilled it and it was GREAT! Wouldn't change a thing!